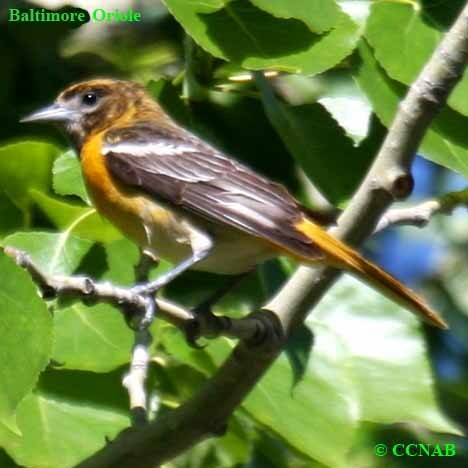 Species: The Baltimore Oriole (Icterus galbula), is known as one of the two sub-species of the "Northern Oriole", the other being the Bullock's Oriole. It was given its' name from George Calvert, Lord Baltimore, whose dress reflected the same colourations. 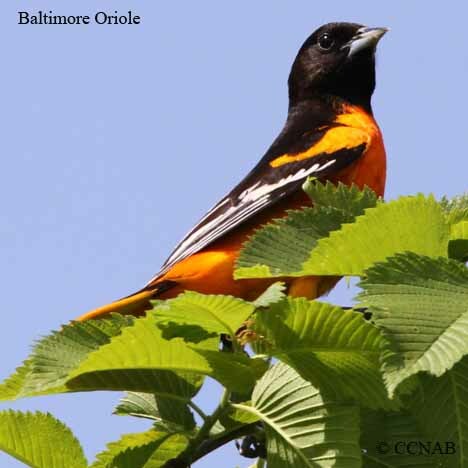 This is the state bird of Maryland. Distinctions: Breeds throughout the eastern parts of North America, west as far as western areas of Alberta. This is mostly likely the only orange bird seen north of most of southern US states. 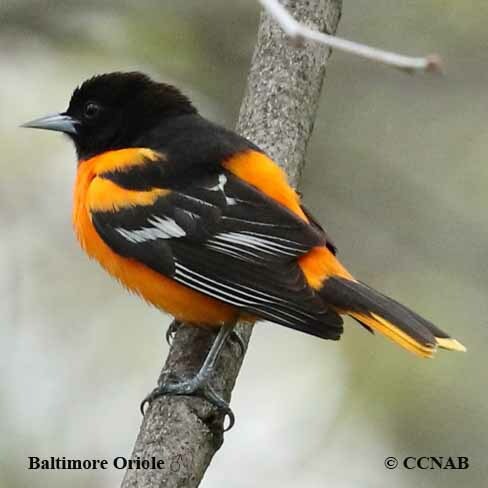 It can be confused with the Bullock's Oriole and the difference being, that the Baltimore Oriole has an all-black head and lesser white feathering on the wings. Females of the two species are very similar. 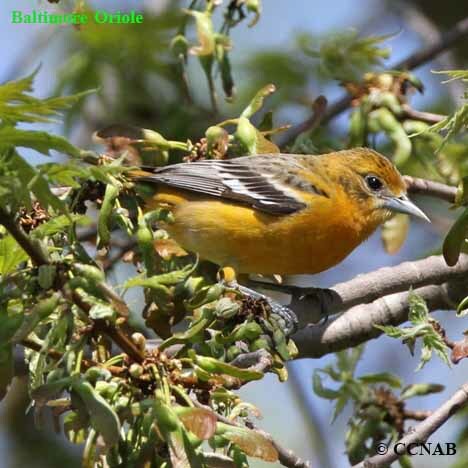 More of an overall orange tone than green when compared to the female Bullock's Oriole. Nesting: Four to six greyish eggs, with brown and black coloured spots. 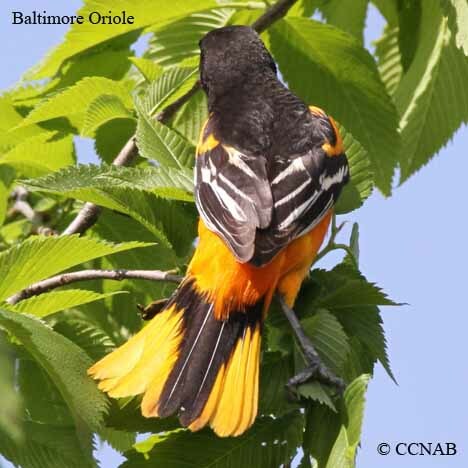 Orioles build their nest high in the crowns of trees. These nests are very recognizable, seen as hanging baskets, woven together using plant fibres, bark from branches, string and any other such materials that can be manipulated to form a nest attached to swaying limbs. 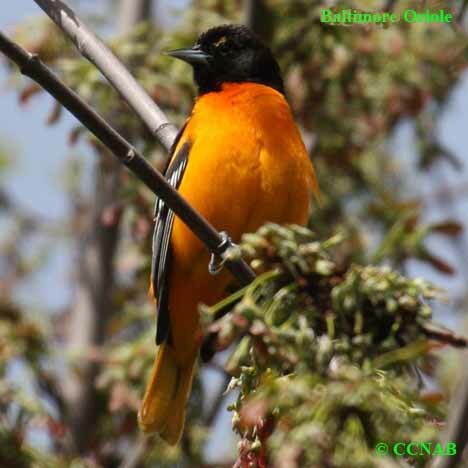 Distribution: The Baltimore Oriole can be found from Newfoundland and Labrador, through southern Quebec and Ontario across the souhtern prairies to eastern Britsih Columbia. Into Montana, through the central states to eastern Texas, eastward through Louisiane to the Carolinas states, northward to Nova Scotia. Spends its winter throughout Florida, Mexico, the Central and the South Americas.